CanadianGardenJoy: Have you got some "Eyeliner" ? Have you got some "Eyeliner" ? OK ... the title is a bit of a tease .. but I'm a crazy Canuck who is snowed in and still let loose on my computer. Husband should shut this down, and lock up my office so I will STOP cruising plant sites and sneaking orders in here and there. I'm sick of snow and cold. I keep dreaming of what I can do with my garden and what unusual ? plants I just might find that might be "bang for my buck"! A different lily I ran into ... totally by surprise, because one of my garden related passions is the hate I have for lily beetles .. that is why I have restricted myself to Casa Blanca, which I love. BUT ... Eyeliner lily has definitely caught my attention . 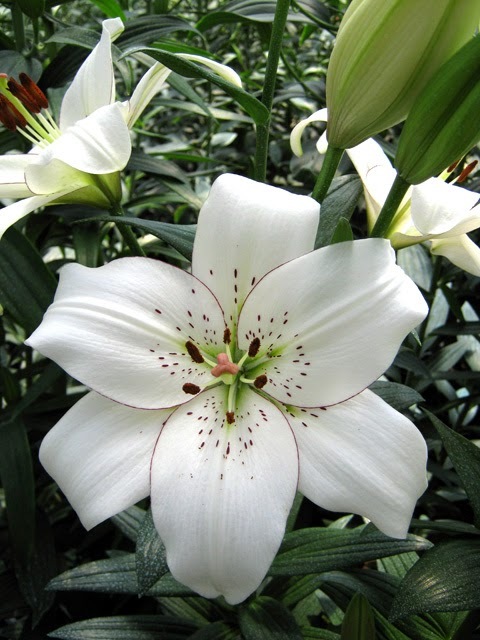 It is a hybrid of Longiflorum x Asiatic ... an "Easter" lily combined with an Asiatic lily. Attributes from both and a light scent .. not an overpowering one to draw more beetles. It was actually described as a perfect partner with Casa Blanca because of the dark spots and edge lining. From "Brent & Becky's Bulbs"
"Lovely, smooth and creamy, this luscious lily will be terrific alone, but will blend with any color scheme. The lilies in this group are a result of much work in laboratories and fields to cross Asiatic Lilies with Longiflorum (Easter Lily) Types. Most bloom early, have fragrance and great substance (like the Longiflorum types), but most are outfacing like the Asiatic Lilies. They show strength, disease resistance and tolerance to viruses which make them exceptional for the garden and also for cut flowers. The best of both worlds are present in this small group of lilies; 2-3 per sq. 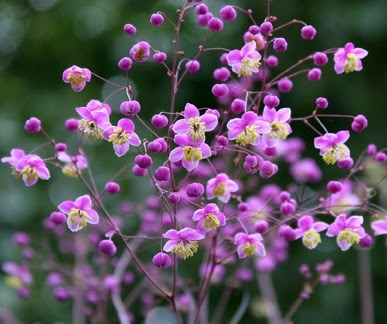 ft.; 16/18+cm; zones 4-8; 2'-3' tall"
I fell in love with this meadow rue years ago when I was more of a novice and didn't really know what a treasure I had stumbled upon. It grew to enormous heights ...and of course I never got a picture worthy of it. It gave me about 3 years and I never forgot it, so I have been trying to grow one to that proportion again. Fingers crossed the one I have from Canning Perennials last year, and this one will combine to make a gorgeous monster! Annie's Annuals describes it wonderfully. So there I go again ... with yet another order but on sale I swear !! Welcome to plant addicts anonymous! The first step in getting better is admitting that you have a problem. We're all here to help and we understand the fun of spending the food budget and mortgage payment on plants, the joy of finding just what you've been looking for, the feeling of overwhelming happiness that seizes you when you hand over your credit card or put the number into the computer, the exhilaration of conquest at driving home with a car full of new plants... Oh hell, let's forget this meeting and go plant shopping! I do love lilies especially for the smaller garden. There's always room for one more! Hello there Mr. TOG ! Well aren't you too kind to welcome me into the club wink wink! And wow ! .. that is exactly how it feels like to win those plants you just have to have .. LOL ! Wish I could go plant shopping with you .. I think it would be a hoot! Hello Eileen girl .. I try to restrict the lilies but this one will looks so pretty with Casa Blanca .. I hadn't seen it before and fell hard for it as soon as I saw it!